I've been on a skincare kick lately so I was really excited when I qualified for the recent Influenster Ole Henriksen campaign*. I've used Ole Henriksen's popular Truth Serum and a couple of other best sellers so I'm familiar with the brand. 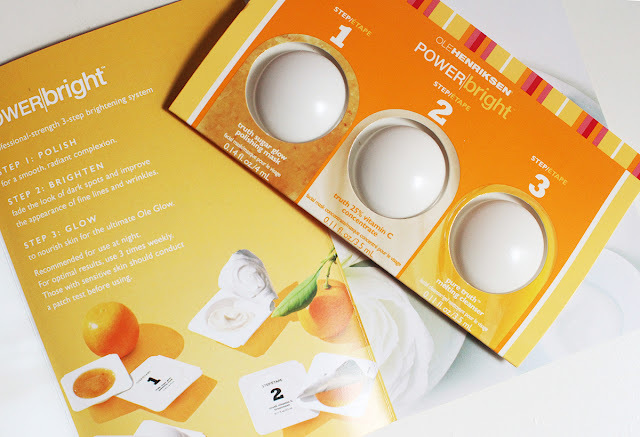 When I opened the VoxBox, my eyes gravitated toward the Ole Henriksen Power Bright immediately. It's a three-step scrub, mask and cleanser treatment that's meant to brighten the skin. Pretty much any skincare product with brightening claims pique my interest and I love me a good mask treatment. 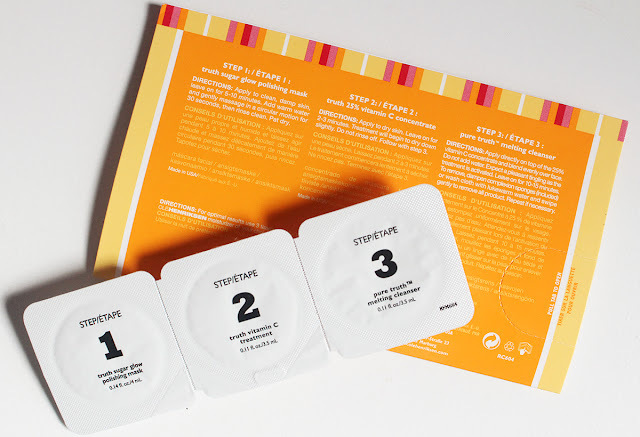 The "system" as Ole Henriksen calls it, is packaged into three little pods. At retail price, six of these will set you back $55 which I think is really pricey since each treatment would be a little over $9. Each pod contained a perfect amount for one full face application which I really appreciate. Interestingly, the Truth Sugar Glow Polishing Mask (step 1) and Pure Truth Melting Cleanser (step 3) are sold separately. But it doesn't look like they sell the Truth Vitamin C Treatment (step 2) by itself. So you would need to purchase these pods if you wanted to do the complete three-step treatment. Starting with the Truth Sugar Glow Polishing Mask, I spread the sugary marmalade all over my face. The mask contains large sugar particles, honey and pomegranate seed powder to polish the skin. I really like the fruity-sweet scent because it wasn't overwhelming or overly artificial. The sticky texture was nice and stayed put on my skin so I didn't have to worry about it dripping off my face. After about 10 minutes I rinsed this off with warm water. The sugar granules gave my skin a gentle exfoliation as the warm water dissolved them into smaller bits. Next, I smoothed on the Truth 25% Vitamin C Concentrate on dry skin. This smells and feels like fruity greek yogurt and I love it! This step feels very soothing on the skin. When I went to wash my hands, the cream leaves behind an oily residue which I wasn't expecting. After having this on your face for two to three minutes, you're meant to proceed directly to step 3. Without rinsing off step 2, I applied the Pure Truth Melting Cleanser right on top of the concentrate to help activate it. Apparently there's supposed to be a warming sensation to indicate it's working but I did't really feel a tingle even after 10 minutes. I've used the Pure Truth Melting Cleanser in the past and I wasn't in love with it as a standalone makeup remover. But in this case, the thinner texture of this cleanser felt nice over top of the Vitamin C Concentrate. Along with the pods, you get two Ole Henriksen Complexion Sponges to help remove the mask. These look like dried pieces of weird cardboard in the package but once you run them through water, they puff up. I didn't actually realize there were two sponges in the package until I hydrated the whole thing.... I liked these sponges much more than I thought I would. They made removing the mask super easy since they absorb some of the product whereas if you were using your fingers, you'd be moving the oily mask around your face more. Even after rinsing and drying my face, I could still feel a bit of oily residue on my skin. This might bother some people but some with dry skin might like it. I didn't really expect to see a major difference in my skin after one use and my hunch was confirmed - this isn't a miracle worker with just one use. Ole Henriksen recommends using this three times a week for best results. While I enjoyed my little masking session, this treatment is more steps than I'm normally used to and I found myself constantly looking at the directions to make sure I was putting the steps on at the right time. I imagine this would be a fun treat to do with friends at a spa night sleepover. For me, I think I'll stick to my one-and-done masks on a weekly basis. *This product was provided by Influenster for consideration. All opinions are my own and 100% honest. This post is not sponsored.